Welcome to my GRAND PRIX LEGENDS SITE, designed originally to showcase the Adelaide South Australian Grand Prix Street Circuit I started making for Grand Prix Legends in 2001. This circuit hosted the Australian Grand Prix as the last Formula 1 race of the season between 1985 and 1995 and is located only 17 km from where I live. * My 15 mile abridged version of the 37 mile ISLE OF MAN MOUNTAIN COURSE that most famous of Bike road racing circuits [so long, it's called a "course" rather than a track or circuit] This is the home of the Isle of Man TT and the Manx GP [ the latter being amateur bike races, not car races ].This is, arguably, the most interesting, challenging, difficult, dangerous [only the very brave need apply] and quite simply the BEST motor racing track in the world, with all due respect to one of my own favourites, the Nurburgring. * DUNDROD, an historic and notoriously difficult Northern Irish road circuit. Have a nice time visiting my site. If you like what you see, please visit my Guest Book. Australian designed and built . Twice Formula 1 Championship winning car. Tracks and Guides are released for individual private use in GPL only. They are not to be used now or in future, in full or in any part [including original track files / track centre lines / 3do's/ image files ] for commercial purposes. 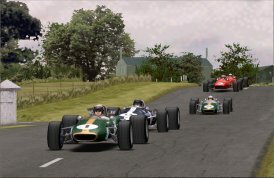 They may not be converted for use in simulations other than Grand Prix Legends without my prior specific written permission . Jim Pearson. If anyone feels they absolutely have to contact me, they can do so through private message at the SRMZ (Sim Racing Mirror Zone).